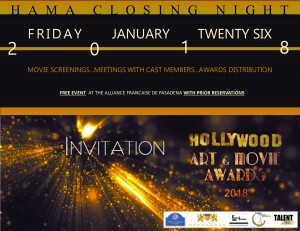 On January 26, 2018, The Alliance Française de Pasadena will host the closing night for the Hollywood Arts and Movie Awards, the international festival of independent film screening created after the Paris Art and Movie Awards. Free movie screenings of all genres as well as meetings with some of the cast members will take place throughout the day. There will also be a photography/ painting exhibition and booths to illustrate the magic of cinema. At the end of the day, the awards will be distributed to the film makers and actors who were selected by a previous jury.